Stromal keratitis (SK) is a chronic immunopathological lesion of the eye caused by HSV-1 infection and a common cause of blindness in humans. The inflammatory lesions are primarily perpetuated by neutrophils with the active participation of CD4+ T cells. Therefore, targeting these immune cell types represents a potentially valuable form of therapy to reduce the severity of disease. Resolvin E1 (RvE1), an endogenous lipid mediator, was shown to promote resolution in several inflammatory disease models. In the current report, we determined whether RvE1 administration begun at different times after ocular infection of mice with HSV could influence the severity of SK lesions. Treatment with RvE1 significantly reduced the extent of angiogenesis and SK lesions that occurred. RvE1-treated mice had fewer numbers of inflammatory cells that included Th1 and Th17 cells as well as neutrophils in the cornea. The mechanisms by which RvE1 acts appear to be multiple. These included reducing the influx of neutrophils and pathogenic CD4+ T cells, increasing production of the anti-inflammatory cytokine IL-10, and inhibitory effects on the production of proinflammatory mediators and molecules, such as IL-6, IFN-γ, IL-17, KC, VEGF-A, MMP-2, and MMP-9, that are involved in corneal neovascularization and SK pathogenesis. These findings are, to our knowledge, the first to show that RvE1 treatment could represent a novel approach to control lesion severity in a virally induced immunopathological disease. Ocular HSV infection of the eye is the most frequent infectious cause of vision impairment in the industrialized world (1). Recurrent episodes may lead to a chronic inflammatory reaction in the corneal stroma that is characterized by vascularization of the normally avascular cornea, which together with stromal opacification impedes vision and can result in blindness (2). Management of stromal keratitis (SK) usually relies on a combination of antiviral and anti-inflammatory drugs, with the latter often needed for lengthy periods to prevent a perpetuating inflammatory reactivation of the lesions (3, 4). The current main anti-inflammatory adjunct therapy to existing antiviral drugs is glucocorticoids that are usually topically administered. However, glucocorticoid treatment of chronic eye inflammation is limited by the high risk of cataract formation and elevated intraocular pressure, in themselves potential threats to vision (5). Accordingly, there is a need for alternative therapies to control SK. One approach would be to exploit the host’s own counterregulatory functions to balance an ongoing inflammatory response and accelerate its resolution toward tissue homeostasis. The resolvins represent one such group of molecules (6), but no information is currently available about their potential to control the immune response during a viral infection and prevent long-term sequelae, such as SK after HSV infection of the eye. Resolvins are endogenous lipid mediators that are derived from the ω-3 polyunsaturated fatty acids eicosapentaenoic acid and docosahexaenoic acid (6). The currently investigated resolvin E1 (RvE1; 5S,12R,18R-trihydroxyeicosapentaenoic acid) was the first resolvin to be identified in exudates of resolving local inflammations and after its full structural elucidation and organic synthesis was confirmed to dampen acute inflammation actively (7–9).Events that are associated with inflammation and controlled by resolvins include prevention of diapedesis, notably neutrophil migration (6), regulation of dendritic cell costimulatory factors leading to reduced T cell activation (10), increased macrophage phagocytosis of apoptotic neutrophils (11), and inhibition of host tissue inflammatory responses, with the release of chemokines and cytokines (11). In addition to regulating inflammation, RvE1 was recently shown to promote tissue repair actively and prevent host tissue cell death during stress (12, 13). Consequently, various resolvins have proved to be efficacious in a range of experimental models of inflammatory diseases including inflammation of the lung (14), colitis (15), periodontitis (16), retinal angiogenesis (17), and very recently dry eye (18). More recently, resolvins have also been demonstrated to dampen the immune response during acute bacterial infections without being immunosuppressive but led to improved bacterial control and enhanced survival (19). Current observations with resolvins suggest that they would be efficacious in controlling SK because the inflammatory events known to be counterregulated by resolvins are necessary steps in the initial pathogenic development of SK, in particular, the rapid neovascularization that permits neutrophils to enter the normally avascular cornea (20). This possibility was investigated in the currently reported experiments using a well-established mouse model of SK in which primary ocular infection with HSV regularly results in chronic, unresolving inflammatory SK lesions orchestrated by T cells (21, 22). In this report, we demonstrate the efficacy of topical therapy with RvE1 in controlling ocular disease caused by HSV. The results show that RvE1 administration markedly diminished SK lesion severity and corneal neovascularization. We show that RvE1 therapy decreased the influx of effector CD4+ T cells, neutrophils, and the production of proinflammatory cytokines and molecules involved in ocular neovascularization, an essential component of SK pathogenesis. Our results indicate that RvE1 therapy may represent a novel approach to control HSV-induced ocular immunopathological lesions, the most common infectious cause of blindness in humans. Female BALB/c mice were purchased from Harlan Sprague-Dawley (Indianapolis, IN). The animals were housed in American Association of Laboratory Animal Care-approved facilities at the University of Tennessee, Knoxville. All investigations followed guidelines of the institutional animal care and use committee. HSV-l RE strain (obtained from the laboratory of Robert Hendricks, University of Pittsburgh, Pittsburgh, PA) was used in all procedures. Virus was grown in Vero cell monolayers (American Type Culture Collection, Manassas, VA), titrated, and stored in aliquots at –80°C until used. Corneal infections of all mouse groups (6–10 wk old) were conducted under a deep anesthesia (Avertin). The mice were scarified lightly on their corneas with a 30-gauge needle, and a 3-μl drop containing 2 × 105 PFU HSV-1 RE was applied to the eye. The methyl ester prodrug of RvE1 (RX-10005; Resolvyx, Bedford, MA) was topically applied to the cornea (300 ng per eye; 3-μl drop) twice daily from day 1 until day 12 postinfection for treatments starting early or was applied twice daily from day 6 to day13 for treatment starting late unless otherwise specified. The vehicle control group received an equal volume of PBS. For systemic administration, mice were given RvE1 intraperitoneally at a dose of 1.0 μg/mouse (0.05 mg/kg body weight) once daily from day 6 to day 13. This particular dosage was selected based on previous studies by other groups (9, 23, 24). The eyes were examined on different days postinfection for the development of clinical lesions by slit-lamp biomicroscopy (Kawa Co., Nagoya, Japan), and the clinical severity of keratitis of individually scored mice was recorded by a blinded observer. The scoring system was as follows: 0, normal cornea; +1, mild corneal haze; +2, moderate corneal opacity or scarring; +3, severe corneal opacity but iris visible; +4, opaque cornea and corneal ulcer; +5, corneal rupture and necrotizing SK. The severity of angiogenesis was recorded as described previously (25). In reference to the angiogenic scoring system, the method relied on quantifying the degree of neovessel formation based on three primary parameters: 1) the circumferential extent of neovessels (as the angiogenic response is not uniformly circumferential in all cases); 2) the centripetal growth of the longest vessels in each quadrant of the circle; and 3) the longest neovessel in each quadrant was identified and graded between 0 (no neovessel) and 4 (neovessel in the corneal center) in increments of ∼0.4 mm (radius of the cornea is ∼1.5 mm). According to this system, a grade of 4 for a given quadrant of the circle represents a centripetal growth of 1.5 mm toward the corneal center. The score of the four quadrants of the eye were then summed to derive the neovessel index (range, 0 to 16) for each eye at a given time point. At the termination of the experiment (14 d postinfection), eyes were removed from control and RvE1-treated mice and snap-frozen in OCT compound (Miles, Elkhart, IN). Six-micrometer-thick sections were cut and stained with H&E. Sections were observed for thickness of cornea, presence of inflammatory infiltrates, ulceration, and epithelial erosions as described previously (26). At day15 corneas were excised, pooled groupwise, and digested with 60 U/ml Liberase (Roche Diagnostics) for 45 min at 37°C in a humidified atmosphere of 5% CO2. After incubation, the corneas were disrupted by grinding with a syringe plunger on a cell strainer, and a single-cell suspension was made in complete RPMI 1640 medium. The single-cell suspensions obtained from corneal samples were stained for different cell surface molecules for FACS analyses. All steps were performed at 4°C. Briefly, a total of 1 × 106 cells were first blocked with an unconjugated anti-CD32/CD16 mAb for 30 min in FACS buffer. After washing with FACS buffer, the cells were stained with respective fluorochrome-labeled Abs for 30 min. Finally, the cells were washed three times and resuspended in 1% paraformaldehyde. To enumerate the number of IFN-γ–, IL-2–, and IL-17–producing T cells, intracellular cytokine staining was performed. In brief, corneal cells were stimulated with anti-CD3 (3 μg/ml) and anti-CD28 (1 μg/ml) for 5 h in the presence of brefeldin A (5 μg/ml) in U-bottom 96-well plates. After this period, cell surface staining was performed, followed by intracellular cytokine staining using a Cytofix/Cytoperm kit (BD Pharmingen) in accordance with the manufacturer’s recommendations. The Abs used were anti-CD4 allophycocyanin, anti–IFN-γ–PE, IL-17 PerCP-Cy5.5, and anti–IL-2–FITC. The fixed cells were resuspended in 1% paraformaldehyde. For stimulation with virus, cells were left untreated or stimulated with 1 multiplicity of infection of UV-inactivated HSV-1 and incubated overnight at 37°C in 5% CO2. Brefeldin A (5 μg/ml) was added for the last 5 h of the culture period. After this period, cell surface staining was performed, followed by intracellular cytokine staining using a Cytofix/Cytoperm kit (BD Pharmingen) in accordance with the manufacturer’s recommendations as mentioned above. The stained samples were acquired with a FACSCalibur (BD Biosciences), and the data were analyzed using the FlowJo software. The corneal samples were pooled groupwise (six corneas/group) and homogenized using a tissue homogenizer (Pellet Pestle mortar; Kontes). The concentrations of various cytokines and VEGF was measured by sandwich ELISA kits from eBioscience (IL-6, IL-10, IFN-γ, IL-17) and R&D Systems (VEGF-A, KC) as per the manufacturer’s instructions. MK/T-1 cells, immortalized keratocytes from the corneal stroma of C57BL/6 mouse (kindly provided by Dr. Dana Reza, Harvard Medical School, Boston, MA), were stimulated in vitro with 10 ng/ml recombinant murine IL-6 in the presence of various concentrations of RvE1 (25, 75, 250, and 750 nM) in DMEM supplemented with 10% FBS for 24 h at 37°C in 5% CO2. After 24 h of stimulation, the supernatants were collected and stored at −80°C until further use. Supernatants were analyzed for VEGF-A production using VEGF-A quantikine sandwich ELISA kit (R&D Systems) as per the manufacturer’s instructions. At 15 d after ocular infection, the corneas were isolated, and four corneas per group were pooled, corneal cells were lysed, and total mRNA was extracted using TRIzol LS reagent (Invitrogen). Total cDNA was made with 1 μg RNA using oligonucleotide primer. Quantitative PCR was performed using SYBR Green PCR Master Mix (Applied Biosystem, Foster City, CA) with iQ5 real-time PCR detection system (Bio-Rad, Hercules, CA). The expression levels of different molecules were normalized to β-actin using ΔCt calculation. Relative expression between control and experimental groups was calculated using the 2−ΔΔCt formula. The PCR primers used were as follows: VEGF-A: forward 5′-GTTCATGGATGTCTACCAGCGAAG-3′, reverse 5′-GAAGATGTACTCTATCTCGTCGGG-3′; MMP-2: forward 5′-CCGATCTACACCTACACCAAGAAC-3′, reverse 5′-CCAGTACCAGTGTCAGTATCAG-3′; MMP-9: forward 5′-CTCTACAGAGTCTTTGAGTCCG-3′, reverse 5′-CCTGTAATGGGCTTCCTCTATG-3′; β-actin: forward 5′-CCTTCTTGGGTATGGAATCCTG-3′, reverse 5′-GGCATAGAGGTCTTTACGGATG-3′. At 15 d after ocular infection, the corneas were isolated, and four corneas per group were pooled The supernatants from lysed corneal cells were quantified using BCA protein assay kit (Thermo Scientific, Waltham, MA) using BSA as a standard, and samples with equal protein concentrations were denatured by boiling in Laemmli buffer. Polypeptides were resolved by SDS-PAGE and transferred onto a polyvinylidene fluoride membrane. The membrane was blocked with 5% BSA in TBS with Tween 20 (20 mM Tris, pH 7.4, 137 mM NaCl, and 0.1% Tween 20) overnight at 40°C and probed with specific primary and secondary Abs. Proteins were detected using chemiluminescent HRP substrate (Millipore, Billerica, MA). The membrane was kept in stripping buffer for 10 min and reprobed using anti–β-actin Ab. The Abs used were mouse anti–VEGF-A (EE02; Santa Cruz Biotechnology, Santa Cruz, CA), mouse anti–MMP-2 (8B4; Santa Cruz Biotechnology), goat anti-mouse MMP-9 (C-20; Santa Cruz Biotechnology), and mouse anti–β-actin (AC74; Sigma-Aldrich, St. Louis, MO), goat anti-rat IgG-HRP (R&D Systems), goat anti-mouse IgG-HRP (Santa Cruz Biotechnology), and donkey anti-goat IgG-HRP (Santa Cruz Biotechnology). Statistical significance was determined by Student t test unless otherwise specified. A p value <0.05 was regarded as a significant difference between groups (*p ≤ 0.05; **p ≤ 0.001; ***p ≤ 0.0001). For some experiments, as mentioned in the legends of figures accompanying this article, one-way ANOVA with Dunnett’s post test was used. GraphPad Prism software was used for statistical analysis. After infection of the corneal surface with HSV, virus replicates in epithelial cells and a prompt, mainly neutrophil influx occurs in the underlying stroma that peaks around 48 h postinfection (26). Analysis of single-cell suspensions from digested corneas obtained from mice sacrificed at 48 h postinfection (after three dosings) confirmed that RvE1 dose-dependently reduced corneal infiltration measured either as total leukocytes (CD45) or neutrophils (11b+Gr1hi) (Fig. 1). In the dose range investigated, 100–1000 ng, a maximum response of 60% reduction in either cell population was evident at the 300-ng dose, with no further reduction at higher doses. Fig. 1 also shows, as expected at this early stage of infection, that the leukocyte population mainly consisted of cells expressing phenotypic markers characteristic of neutrophils. RvE1 reduces cellular infiltration into the cornea of ocularly infected mice in a dose-dependent manner. BALB/c mice were ocularly infected with 2 × 105 PFU HSV-1 RE strain. Different doses (100, 300, 500, 1000 ng) of RvE1 were applied topically at 18, 24, and 36 h postinfection. The animals were sacrificed at 48 h postinfection, and pooled corneal samples were analyzed for surface expression of CD45, 11b, and Gr1 by flow cytometry. A, Number of leukocytes (CD45+) per cornea. B, Number of neutrophils (11b+Gr1hi) per cornea at 48 h postinfection is shown. Data shown are from one representative experiment. Experiments were repeated two times. One-way ANOVA was used to calculate the level of significance. *p ≤ 0.05; **p ≤ 0.001; ***p ≤ 0.0001. Typically, SK becomes evident clinically around 1 wk after HSV infection, at a time when the replicating virus has disappeared, but lesions continue to progress in severity for 7–10 d. To investigate the effects of RvE1 treatment on the clinical consequences, groups of animals were treated twice daily with RvE1 or vehicle starting at day 1 postinfection or day 6 postinfection and continued until 2 d before experiments were terminated on day 15 postinfection. Animals were examined at 2-d intervals to record severity of SK lesions as well as the extent of angiogenesis. In animals beginning treatment at day 1, only 55% of corneas of those receiving RvE1 showed positive lesions compared with 80% of controls (p ≤ 0.009) with the extent of neovascularization being similarly reduced (p ≤ 0.004) (Fig. 2A, 2B). Not only the frequency of lesions but also their severity was reduced with 6% of RvE1-treated animals showing a lesion score of ≥3 compared with 50% in control animals. Angiogenesis was also significantly reduced in the treated animals compared with that in controls (Fig. 2B). At termination on day 15 postinfection, corneas were pooled and isolated cells were identified and enumerated by flow cytometry. The numbers of total leukocytes, neutrophils, and CD4+ T cells were reduced by 86, 93, and 74%, respectively, in the RvE1-treated group compared with the control group, which was highly significant for all three cell populations (Fig. 2C–F). Importantly, when the frequency of subsets of CD4+ T cells producing IFN-γ, IL-2, or IL-17 was investigated after stimulating with CD3/CD28, RvE1 was shown to reduce both Th1 and Th17 populations markedly by 82 and 79%, respectively (Fig. 2H–J). Effect of RvE1 started during the preclinical phase (day 1 postinfection) on SK severity and cellular infiltration. BALB/c mice infected with 2 × 105 PFU HSV-1 RE strain were given RvE1 topically twice daily starting from day 1 until day 12. The disease severity and immune parameters were analyzed at day 15. A and B, SK lesion severity and angiogenesis at day 14 are shown. C, Representative histograms show percentage of leukocytes (CD45+), neutrophils (11b+Gr1hi), and CD4+ T cells in the inflamed cornea of control and RvE1-treated animals at day 15. D–F, Average number of (D) CD45+ cells, (E) 11b+Gr1hi, and (F) CD4+ T cells per cornea at day 15 postinfection is shown. G, Representative plots show percentage of CD4 cells producing IFN-γ, IL-2, or IL-17 after stimulation with CD3/CD28 in the corneas of infected animals. Plots shown were gated on CD4+ T cells. H–J, Average number of CD4 cells producing (H) IFN-γ, (I) IL-2, and (J) IL-17 in the cornea is shown. Experiments were repeated three times, and the level of significance was determined by Student t test (unpaired). *p ≤ 0.05; **p ≤ 0.001. In the second series of experiments, RvE1 treatment was begun at day 6 postinfection, a time point when replicating virus was no longer detected on the HSV-infected corneas (data not shown). This time point also corresponds with the beginning of the chronic stage of SK with infiltration of pathogenic CD4+ T cells that orchestrate SK lesion development. Monitoring the progression of disease over the subsequent 10 d, a delayed onset of neovascularization and SK was seen in the RvE1-treated group, which then progressed at a slower rate (Fig. 3A, 3B). At the termination of the experiment on day 15 postinfection, there was a significant reduction in both the extent of neovascularization and the severity of SK in RvE1-treated animals (Fig. 3C–F). Nearly 60% of eyes from untreated animals exhibited severe lesions (score ≥3) compared with 20% in the RvE1-treated group (p ≤ 0.02). Immunohistochemical staining showed that corneas from untreated mice were swollen and contained a massive infiltrate of inflammatory cells compared with those from RvE1-treated mice (Fig. 3G, 3H). 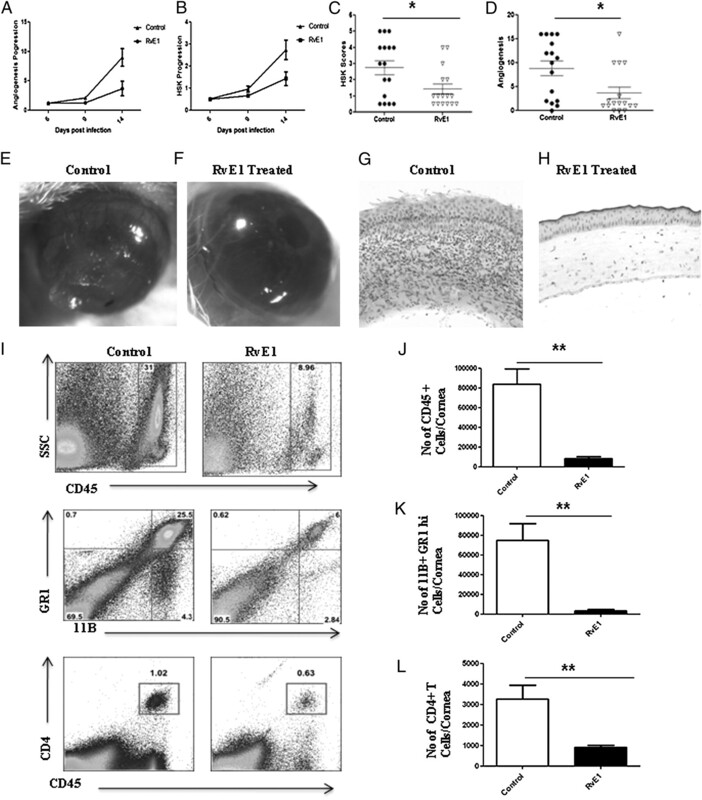 The numbers of infiltrating leukocytes and neutrophils in infected corneas at the day of termination were reduced by almost 90% in mice treated with RvE1 (Fig. 3I, 3K). Additionally, the numbers of CD4+ T cells were reduced by almost 70% compared with that in control animals. Also with a delayed onset of treatment, the numbers of CD4+ T cells of both Th1 and Th17 subtypes were found to be reduced in the group treated with RvE1 when the corneal cell suspensions from different treatment groups were stimulated with either CD3/CD28 or HSV-1 Ags (Fig. 4). Effect of RvE1 started during the clinical phase (day 6 postinfection) on corneal inflammation and cellular infiltration. BALB/c mice infected with 2 × 105 PFU HSV-1 RE strain were given RvE1 topically twice daily starting from day 6 until day 13. The disease progression and immune parameters were analyzed. A and B, Disease progression of lesions and angiogenesis are shown. C and D, SK lesion severity and angiogenesis at day 14 are shown. E and F, Photographs of eyes of control and RvE1-treated animals showing lesion severity at 14 d postinfection (from a representative experiment). Images were captured by stereomicroscopy and an imaging system. Original magnification ×20. G and H, Mice were terminated at day 14 postinfection, and eyes were processed for cryosection. H&E staining was performed on 6-μm sections. The figure shows photographs of the sections taken at ×20 magnification. I, Representative histograms show percentages of leukocytes (CD45+), neutrophils (11b+Gr1hi), and CD4+ T cells in the inflamed corneas of control and RvE1-treated animals at day 15. J–L, Average number of (J) CD45+ cells, (K) 11b+Gr1hi, and (L) CD4+ T cells per cornea at day 15 postinfection is shown. Experiments were repeated three times and the level of significance was determined by Student t test (unpaired). *p ≤ 0.05; **p ≤ 0.001. Effect of RvE1 started during the clinical phase (day 6 postinfection) on Th1 and Th17 cell infiltration into the inflamed cornea at day 15. BALB/c mice infected with 2 × 105 PFU HSV-1 RE strain were given RvE1 topically twice daily starting from day 6 until day 13. A, Representative plots show percentage of CD4 cells producing IFN-γ, IL-2, or IL-17 after stimulation with CD3/CD28 in the corneas of infected animals. Plots shown were gated on CD4+ T cells. B–D, Average number of CD4 cells producing (B) IFN-γ, (C) IL-2, and (D) IL-17 in the cornea at day 15 is shown. E, Representative plots show percentage of CD4 cells producing IFN-γ, IL-2, or IL-17 after stimulation with HSV-1 in the corneas of infected animals. Plots shown were gated on CD4+ T cells. F–H, Average number of CD4 cells producing (F) IFN-γ, (G) IL-2, and (H) IL-17 in the cornea at day 15 is shown. Experiments were repeated three times, and the level of significance was determined by Student t test (unpaired). *p ≤ 0.05. Pooled corneal extracts were collected on day 15 postinfection from control and from RvE1-treated (started 6 d postinfection) animals, and sample pools were analyzed for IFN-γ, IL-17, IL-6, CXCL1, IL-10, and VEGF-A protein levels using ELISA. The data show that RvE1 treatment reduced the production of IFN-γ by 47% in the RvE1-treated mice (p ≤ 0.002) (Fig. 5A). Although the levels of IL-17 were lower in the RvE1-treated group, the differences were not significant (Fig. 5B). 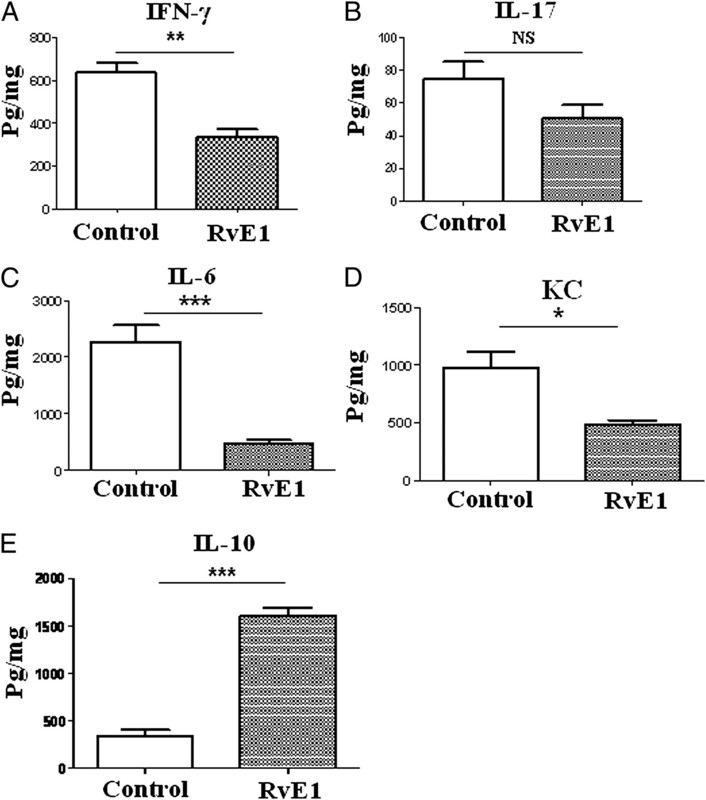 Importantly, the levels of IL-6, a key proinflammatory cytokine involved in SK pathology (27), were substantially reduced by 80% in RvE1-treated mice compared with those of the control group (Fig. 5C). The levels of KC, a chemokine that has a major role in neutrophil early migration, were reduced by 50% in the RvE1-treated group compared with those of untreated mice (Fig. 5D). A striking finding was that RvE1 treatment induced production of IL-10 with a 7-fold higher level observed over that in corneal tissue from control animals (Fig. 5E). 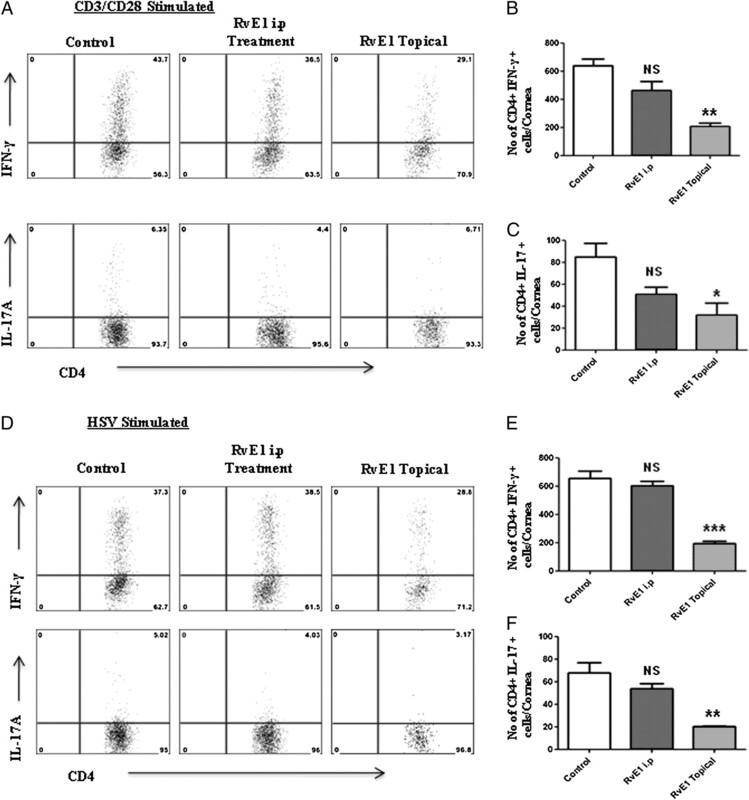 Effect of RvE1 treatment on cytokine and chemokine production in the corneas of HSV-1–infected animals. BALB/c mice infected with 2 × 105 PFU HSV-1 RE strain were given RvE1 topically twice daily starting from day 6 until day 13. Mice were sacrificed at day 15, and corneal extracts were measured by sandwich ELISA. IFN-γ (A), IL-17 (B), IL-6 (C), KC (D), and IL-10 (E) protein levels in four different pooled corneal samples each consisting of four cornea/group in control and RvE1-treated animals are shown. The level of significance was determined by Student t test (unpaired). *p ≤ 0.05; **p ≤ 0.001; ***p ≤ 0.0001. Consistent with a reduction in new vessel formation in corneas from RvE1-treated animals, the VEGF-A levels were reduced by 41% (p ≤ 0.006) (Fig. 6A–C). There was also a change in the levels of MMP-2 and MMP-9, molecules also associated with the neovascularization process in the eye (28). RvE1 effectively blunted the increased levels of MMP-2 and MMP-9 in corneal tissues from control mice (Fig. 6D–F). The levels of MMP-2 were reduced by 3-fold and those of MMP-9 by 7-fold in corneal tissue from the RvE1-treated group compared with those of the control group. Additionally, we also measured the in vitro production of VEGF-A in MK/T-1, a murine stromal fibroblast cell line. For this purpose, MK/T-1 cells were stimulated for 24 h in the presence of IL-6 alone or IL-6 in combination with different doses of RvE1 and the supernatant analyzed for VEGF-A production using ELISA. As is evident in Fig. 6G, VEGF-A production was suppressed by RvE1 in a dose-dependent manner. The effect of RvE1 on VEGF-A production was significantly reduced at both 250 and 750 nM doses of RvE1 compared with that in cells stimulated with IL-6 alone. Taken together our results indicate that RvE1 treatment served to diminish pathological lesions by a number of mechanisms. Effect of RvE1 treatment on proangiogenic factors. BALB/c mice infected with 2 × 105 PFU HSV-1 RE strain were given RvE1 topically twice daily starting from day 6 until day 13. Mice were sacrificed at day 15. A, VEGF-A protein levels in four different pooled corneal samples each consisting of four corneas/group in control and RvE1-treated animals were quantified using quantikine sandwich ELISA kit (R&D Systems). B, Immunoblot showing VEGF-A expression in the pooled corneal homogenates from corneas obtained from naive and HSV-1–infected control and RvE1-treated animals. C–E, Quantitative PCR was used measure the expression of (C) VEGF-A, (D) MMP-2, and (E) MMP-9 in pooled corneal samples each consisting of four cornea/group in control and RvE1-treated animals. The experiments were repeated three times. F, Immunoblot showing MMP-2 and MMP-9 expression in the pooled corneal homogenates from corneas obtained from naive and HSV-1–infected control and RvE1-treated animals. The experiments were repeated two times, and the level of significance was determined by Student t test (unpaired). G, Effects of RvE1 on VEGF-A production. MK/T-1 cells were stimulated with recombinant murine IL-6 in the presence of various doses of RvE1 for a 24-h period. VEGF-A protein levels in the supernatants were measured using sandwich ELISA. One-way ANOVA was used to calculate the level of significance. *p ≤ 0.05. Normally, the cornea is an avascular tissue that contributes to its immune privilege, but this breaks down when angiogenesis occurs after HSV-1 infection (28). It was therefore of interest to investigate if systemic administration of RvE1 would be efficacious in established disease. For this purpose, the effect of RvE1 on HSV-induced lesions was investigated after i.p. administration starting at day 6 postinfection. In this experiment, the efficacy of systemic administration was compared with a parallel group receiving topical RvE1 treatment (300 ng) and an untreated control group. The dose of i.p. administered RvE1 was chosen at 1 μg per mouse (0.05 mg/kg body weight) based on past experience in other models of inflammation (9, 23, 24). As with the previous topical experiments, the mice were scored for extent of disease on day 14 postinfection and sacrificed on day 15 postinfection for analysis of cell and mediator content. Administration of RvE1 systemically reduced SK immunopathology compared with untreated control mice almost as efficaciously as topical administration, with control mice having a frequency of severe lesions of 69% (score ≥3) compared with 31% for systemic and 19% for topical administration (Fig. 7A–D). Although there was a 70% (p ≤ 0.002) reduction in neutrophil content in corneas from mice administered RvE1 intraperitoneally and to the same magnitude as seen with topical administration, a notable finding was the less marked attenuation of corneal CD4+ cells with i.p. compared with topical treatment (Fig. 7F–I). This was further confirmed when isolated cell suspensions from different treatment groups were stimulated with either CD3/CD28 or HSV, and consistently a lesser effect was observed with systemic administration compared to topical treatment on CD4+ T cells producing IFN-γ or IL-17 (Fig. 8). There was only a marginal difference in the influx of macrophages (11b+F4/80+) between the RvE1-treated and control groups (Fig. 7H). These results show that although both systemic and topical treatments were effective, topical treatment proved to be the better approach. Effect of systemic administration of RvE1 started during the clinical phase (day 6 postinfection) on corneal inflammation and cellular infiltration. BALB/c mice infected with 2 × 105 PFU HSV-1 RE strain were given RvE1 either intraperitoneally or topically twice daily starting from day 6 until day 13. A and B, SK lesion severity and angiogenesis at day 14 are shown. C and D, Cumulative lesion and angiogenesis scores are shown. E, Representative histograms show percentages of leukocytes (CD45+), neutrophils (11b+Gr1hi), and CD4+ T cells in the inflamed corneas of control and RvE1-treated animals at day 15. F–I, Average number of (F) CD45+ cells, (G) 11b+Gr1hi, (H) 11b+F4/80 (macrophages), and (I) CD4+ T cells per cornea at day 15 postinfection is shown. Experiment was repeated two times. One-way ANOVA was used to calculate the level of significance. *p ≤ 0.05; **p ≤ 0.001; ***p ≤ 0.0001. Effect of systemic administration of RvE1 started during the clinical phase (day 6 postinfection) on Th1 and Th17 cell infiltration into the inflamed cornea at day 15. BALB/c mice infected with 2 × 105 PFU HSV-1 RE strain were given RvE1 either intraperitoneally or topically twice daily starting from day 6 until day 13. A, Representative plots show percentage of CD4 cells producing IFN-γ or IL-17 after stimulation with CD3/CD28 in the corneas of infected animals. Plots shown were gated on CD4+ T cells. B and C, Average number of CD4 cells producing (B) IFN-γ and (C) IL-17 in the cornea at day 15 is shown. D, Representative plots show percentage of CD4 cells producing IFN-γ or IL-17 after stimulation with HSV-1 in the corneas of infected animals. Plots shown were gated on CD4+ T cells. E and F, Average number of CD4 cells producing (E) IFN-γ and (F) IL-17 in the cornea at day 15 is shown. Experiments were repeated two times. One-way ANOVA was used to calculate the level of significance. *p ≤ 0.05; **p ≤ 0.001; ***p ≤ 0.0001. A troublesome consequence of HSV infection of the eye is a chronic inflammatory reaction in the corneal stroma that may persist after clearance of virus and can lead to impaired vision and eventually blindness (3). Management of SK lesions usually relies on a combination of antiviral and anti-inflammatory drugs with the latter commonly needed for lengthy periods, which, with corticosteroids as a preferred choice, can have unwanted side effects, notably elevated intraocular pressure and cataract. In the current report, we have used a novel approach to control SK lesions in a mouse model of SK using RvE1, which is endogenously biosynthesized through oxidation of the ω-3 polyunsaturated fatty acid eicosapentaenoic acid and shown to regulate resolution of inflammation (6). Administration of RvE1 was efficacious whether begun soon after or at a later stage postinfection. Administered topically as its methyl ester prodrug (prepared by full organic synthesis), RvE1 inhibited several key events in SK pathogenesis. These included inhibitory effects on the infiltration of inflammatory cells, particularly neutrophils and CD4+ T cells, into the inflamed cornea. There was also a reduction in the levels of inflammatory cytokines and an increase in IL-10, an anti-inflammatory cytokine associated with the resolution of SK lesions (29, 30). The currently demonstrated in vivo response to RvE1 with an elevation in tissue IL-10 levels supports earlier in vitro findings using isolated cell systems, suggesting that this may be a feature shared by proresolving lipid-derived mediators, including lipoxins and protectins (31, 32). 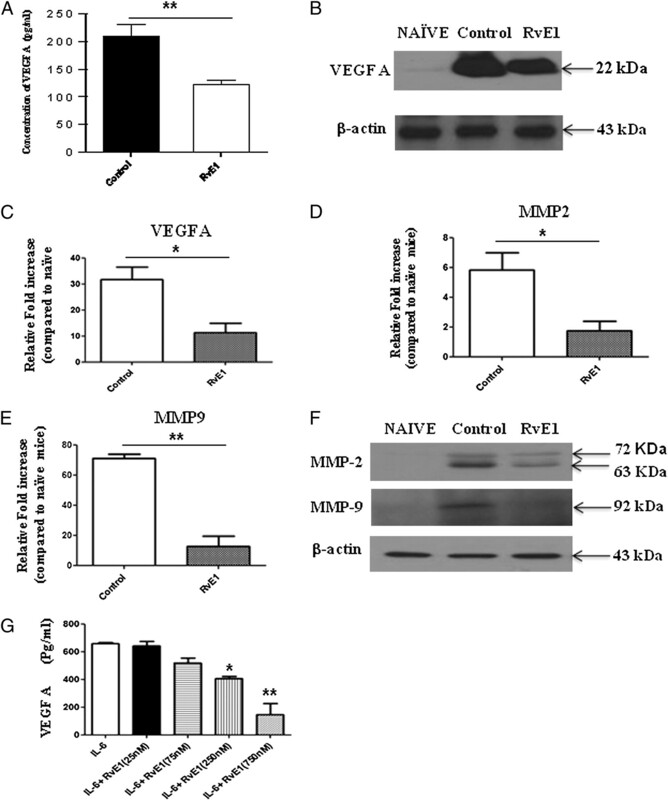 RvE1 treatment also resulted in reduced ocular neovascularization, likely because of inhibitory effects on the production of the angiogenic factor VEGF-A and metalloproteinases MMP-2 and MMP-9, which are involved in angiogenesis (28, 33, 34). RvE1 therapy could represent a useful approach for the management of HSV-induced inflammatory lesions. SK is an example of a chronic virally induced immunopathological lesion (20). Studies in mice have demonstrated that SK is orchestrated principally by CD4+ T cells that are mainly of the Th1 subset with an ancillary role for Th17 cells later in the disease process (21). The actual damage to the eye and the resultant vision impairment is caused mainly by inflammatory cells, particularly neutrophils and their products that are recruited to the eye by mediators released by CD4+ T cells (26). Without treatment, the mouse eye lesion usually does not regress even though replicating virus is cleared from the cornea within a week postinfection (34). RvE1 treatment represents a logical therapeutic approach for SK because several studies have now established that resolvins play a natural role in resolving inflammatory lesions and that a principal target for RvE1 activity is neutrophils, the cell type that dominates inflammatory reactions in SK (6, 26). One prominent effect in targeting neutrophils is the stimulation of macrophage-mediated phagocytosis to enhance the removal of apoptotic neutrophils (11). Additionally, resolvins may exert inhibitory effects on inflammatory cell recruitment to damaged tissue sites as well as to angiogenesis (11, 35), although the actual mechanisms by which these effects are mediated are currently not fully understood. In our own studies, we could show that the influx of neutrophils was markedly attenuated with RvE1 treatment. Several current findings may explain the regulation of neutrophils in the HSV-infected cornea. First, RvE1 attenuated both Th1 and Th17 responses, with the former well documented to orchestrate the perpetuating immune response in SK (21, 26). However, regulation of Th17 activity measured both ex vivo and as tissue levels of IL-17 were reduced to the degree seen for Th1 activation. 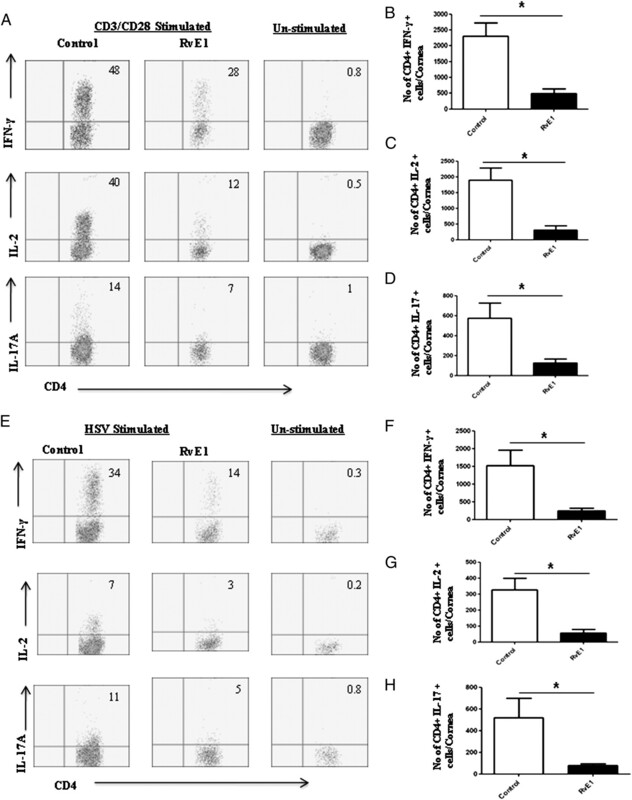 Th17/IL-17 has increasingly been suggested as a regulatory hub between the innate and the adaptive immune response arms with IL-17 regulating both CXCL1 (KC) and CXCL8 responses, which are prominent regulators of neutrophil migration (36). In our model, we could show that RvE1 treatment attenuated levels of KC. Furthermore, human data suggest that IL-17 is expressed in corneas from patients with SK and that IL-17 is constitutively expressed in corneal fibroblasts, supporting IL-17 as an important therapeutic target (37). The current in vivo experiments cannot separate between a direct or indirect effect in dampening the T cell responses. However, previous observations suggest that RvE1 can prevent upregulation of costimulatory molecules on APCs and also that mixed cell populations and not purified T cells are required for the dampening of both Th1 and Th17 responses (10). In this model, Ag presentation and T cell activation is early suggesting that other mechanisms may account for the dampened T cell responses seen with treatment initiation at day 6 postinfection. A novel finding in our infectious model investigating actions of resolvins was the profound upregulation of IL-10, which is also considered a master switch in the control of keratitis (29) and a major regulator of T helper cell activation (38). The production of IL-10 could explain the efficacy of late RvE1 treatment (starting day 6 postinfection) in the SK model. Another, key event in regulating the severity of keratitis is control of IL-6 (27). In agreement with earlier observations with RvE1, the IL-6 response was blunted (14). IL-6 not only contributes to the regulation of neutrophil diapedesis into inflamed tissues but is also required for expansion of Th17 cells (36). The source of IL-6 may be either leukocytic or could derive from the virus-infected corneal epithelium (27). Previous data on human corneal epithelial cells indicate that RvE1 prevents the release of hyperosmotic stress-induced IL-6 and IL-8 secretion indicating that actions of RvE1 in dampening a pathological immune response are not limited to actions on bone marrow-derived cells, as was initially described. An important aspect of switching an active inflammatory event toward resolution to reestablish tissue homeostasis is clearance of apoptotic neutrophils through the activation of resolution-phase macrophages (39). Several resolvins, including RvE1, were recently documented to stimulate macrophage phagocytosis of apoptotic neutrophils (31) and the time course of their activation after RvE1 exposure described (32). We did not specifically attempt to quantify subsets of macrophages as either of predominately proinflammatory or proresolution phenotype, but it was interesting to note that in animals treated with RvE1, the levels of macrophages at day 15 postinfection were proportionately less reduced than either those of neutrophils or T helper cells. It should also be noted that resolution-type macrophages are reported to secrete IL-10 in response to RvE1 exposure (32). Ocular neovascularization is a key event in the pathogenesis of SK with the lesion being limited in severity by procedures that inhibit the production of, or response to, molecules involved in new blood vessel development (40). Angiogenesis is increasingly seen as an inflammation-triggered VEGF-mediated response, whether in the cornea or retina (41), and not unexpectedly corneal neovascularization after HSV inoculation was inhibited in RvE1-treated mice. Several factors in addition to inhibition of VEGF-A release likely contributed to the marked inhibition, including control of MMP-2, MMP-9, and angiopoietin (data not shown for angiopoietin) and may be attributed to the reduced levels of IL-6 measured in corneal tissue of RvE1-treated mice. IL-6 is considered a major stimulus of VEGF-A formation in HSV-induced neovascularization through activation of stromal resident cells as an additional source to migrating leukocytes for VEGF-A (27). Thus, RvE1 regulation of both epithelial release of IL-6 and leukocyte infiltration could together explain the reduced levels of VEGF-A. From our in vitro studies, we showed that RvE1 reduced VEGF-A protein levels in a producing cell line. Conceivably, RvE1 acts similarly in vivo to inhibit angiogenesis factor production in one or more producing cell types, but this needs to be formally demonstrated. In addition, control of corneal neovascularization by resolvins has previously been demonstrated using the suture model to induce an inflammatory response (35) or in the retina using the oxygen-induced retinopathy model (17). Further studies are under way to establish how RvE1 acts mechanistically to limit the extent of angiogenesis in the SK model. Systemic administration of RvE1 seemed somewhat less efficacious than topical administration. It may be argued that we did not explore a dose-response relationship for systemic administration, as was done for topical delivery, but a dose level selected for analysis is known from other systems of inflammation to give maximum RvE1 inhibition of an inflammatory response (9, 23, 24). However, it is noteworthy that there was no effect on CD4+ cells after systemic administration of RvE1. This may indicate that despite neovascularization, parts of the cornea may remain inaccessible to systemic drug delivery and/or that newly formed pathological vessels do not function optimally for drug delivery. In humans, SK represents an important cause of visual problems, and current treatment modalities are not considered ideal. Corticosteroids, for example, which are used for prolonged periods, have several side-effects that include additional effects on vision, such as cataract formation and increased susceptibility to glaucoma (5). Because resolvins, as well as some other groups of molecules derived from ω-3 fatty acids, such as the protectins (6), are endogenous molecules responsible for resolving inflammatory reactions under normal circumstances, they are expected to have limited side-effects. In our reported studies, we only administered resolvins in the early phases of SK. However, the effects of treatment at later stages, which is technically difficult as later-stage lesions become severe in mouse models, is warranted, because this may better reflect the situation presented by human SK. Resolvins show initial high promise for use to control ocular inflammatory disease and are further supported by very recent reports demonstrating that resolvin treatment may have value in the dry eye syndrome (18) as well as in inflammatory lesions that affect the retina (17). In conclusion, use of resolvins that are without evident toxicity could represent a useful addition to the therapeutic management of virus-induced ocular inflammatory lesions and could conceivably, due to their origin as proresolving mediators that are enzymatically produced from ω-3 polyunsaturated fatty acids, represent a safe treatment alternative. P.G. is an officer and share holder of Resolvyx Pharmaceuticals. We thank Shravan Sehrawat, Tamara Veiga Parga, Shalini Sharma, Greg Spencer, and Eric Schwartz for assistance during research and manuscript preparation. This work was supported by National Institute of Allergy and Infectious Diseases Grant AI 063365 and National Institutes of Health Grant EY 005093. 2001. Herpes simplex virus epidemiology and ocular importance. Cornea 20: 1–13. 2007. Ganciclovir ophthalmic gel, 0.15%: a valuable tool for treating ocular herpes. Clin Ophthalmol 1: 441–453.
. 2004. Herpetic eye disease: immunopathogenesis and therapeutic measures. Expert Rev. Mol. Med. 6: 1–14.
. 2009. Management of herpes simplex virus stromal keratitis: an evidence-based review. Surv. Ophthalmol. 54: 226–234.
. 2002. Locally administered ocular corticosteroids: benefits and risks. Drug Saf. 25: 33–55.
. 2008. Resolving inflammation: dual anti-inflammatory and pro-resolution lipid mediators. Nat. Rev. Immunol. 8: 349–361.
. 2000. Novel functional sets of lipid-derived mediators with antiinflammatory actions generated from omega-3 fatty acids via cyclooxygenase 2-nonsteroidal antiinflammatory drugs and transcellular processing. J. Exp. Med. 192: 1197–1204.
. 2002. Resolvins: a family of bioactive products of omega-3 fatty acid transformation circuits initiated by aspirin treatment that counter proinflammation signals. J. Exp. Med. 196: 1025–1037.
. 2005. Resolvin E1, an endogenous lipid mediator derived from omega-3 eicosapentaenoic acid, protects against 2,4,6-trinitrobenzene sulfonic acid-induced colitis. Proc. Natl. Acad. Sci. USA 102: 7671–7676.
. 2008. 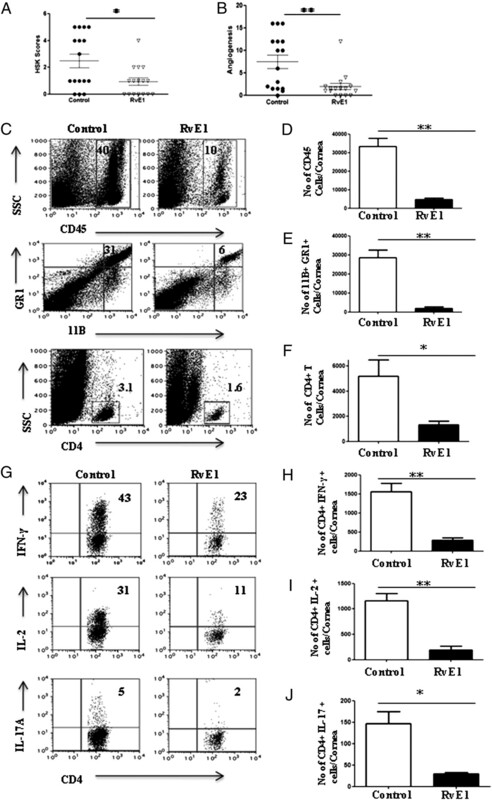 Bone marrow-derived dendritic cells generated in the presence of resolvin E1 induce apoptosis of activated CD4+ T cells. J. Immunol. 181: 4534–4544.
. 2010. Specialized pro-resolving lipid mediators in the inflammatory response: an update. Biochim. Biophys. Acta 1801: 1260–1273.
. 2010. Dependence of resolvin-induced increases in corneal epithelial cell migration on EGF receptor transactivation. Invest. Ophthalmol. Vis. Sci. 51: 5601–5609.
. 2010. Resolvin E1 protects the rat heart against reperfusion injury. Am. J. Physiol. Heart Circ. Physiol. 299: H153–H164.
. 2008. 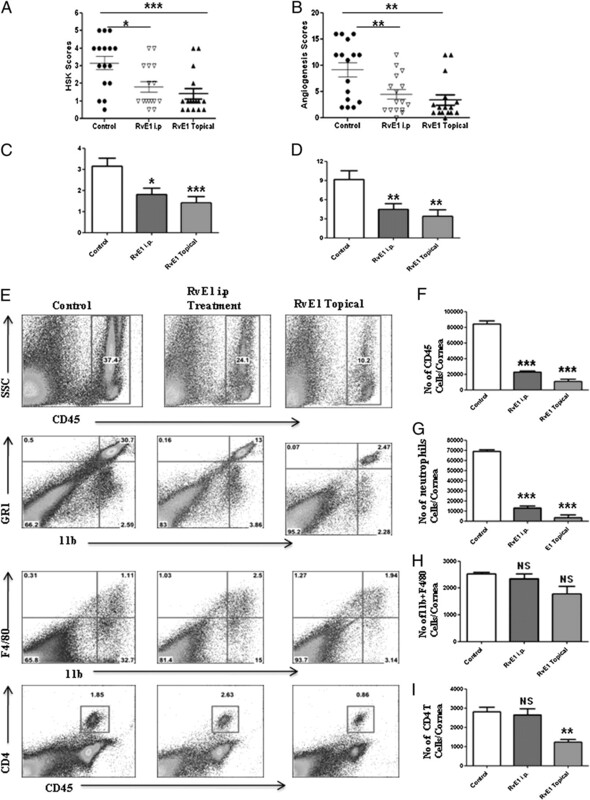 Resolvin E1 regulates interleukin 23, interferon-gamma and lipoxin A4 to promote the resolution of allergic airway inflammation. Nat. Immunol. 9: 873–879.
. 2010. Resolvin E1, an endogenous lipid mediator derived from eicosapentaenoic acid, prevents dextran sulfate sodium-induced colitis. Inflamm. Bowel Dis. 16: 87–95.
. 2007. Resolvin E1 regulates inflammation at the cellular and tissue level and restores tissue homeostasis in vivo. J. Immunol. 179: 7021–7029.
. 2007. Increased dietary intake of ω-3-polyunsaturated fatty acids reduces pathological retinal angiogenesis. Nat. Med. 13: 868–873.
. 2010. 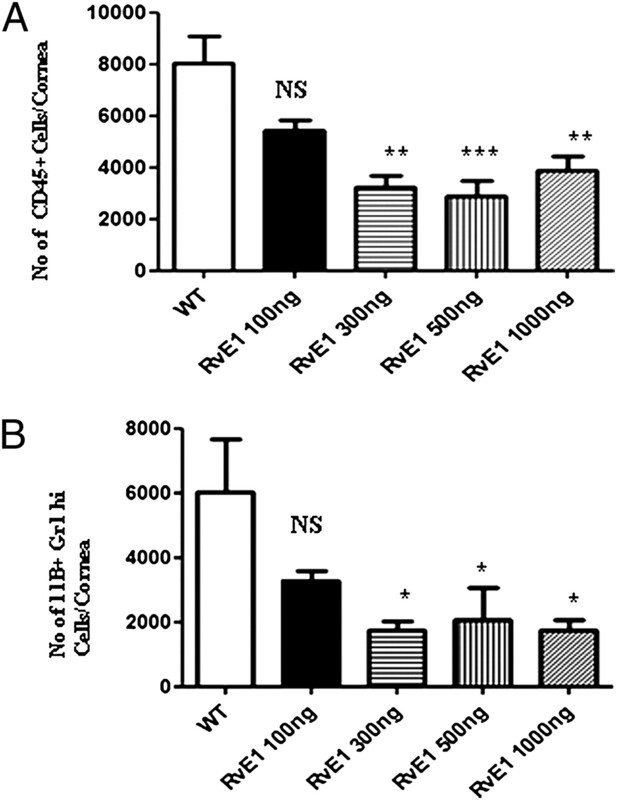 Resolvin e1 improves tear production and decreases inflammation in a dry eye mouse model. J. Ocul. Pharmacol. Ther. 26: 431–439.
. 2010. The anti-inflammatory and proresolving mediator resolvin E1 protects mice from bacterial pneumonia and acute lung injury. J. Immunol. 184: 836–843.
. 2002. Mechanisms of pathogenesis in herpetic immunoinflammatory ocular lesions. Vet. Microbiol. 86: 17–26.
. 1992. Predominance of Th1 cells in ocular tissues during herpetic stromal keratitis. J. Immunol. 149: 3035–3039.
. 1990. Contribution of virus and immune factors to herpes simplex virus type I-induced corneal pathology. Invest. Ophthalmol. Vis. Sci. 31: 1929–1939.
. 2010. Protective effect of resolvin E1 on the development of asthmatic airway inflammation. Biochem. Biophys. Res. Commun. 400: 128–133.
. 2010. Resolvin E1-induced intestinal alkaline phosphatase promotes resolution of inflammation through LPS detoxification. Proc. Natl. Acad. Sci. USA 107: 14298–14303.
. 2006. Depletion of MCP-1 increases development of herpetic stromal keratitis by innate immune modulation. J. Leukoc. Biol. 80: 1405–1415.
. 1997. On the essential involvement of neutrophils in the immunopathologic disease: herpetic stromal keratitis. J. Immunol. 158: 1383–1391.
. 2006. Involvement of IL-6 in the paracrine production of VEGF in ocular HSV-1 infection. Exp. Eye Res. 82: 46–54.
. 2002. Role of matrix metalloproteinase-9 in angiogenesis caused by ocular infection with herpes simplex virus. J. Clin. Invest. 110: 1105–1111.
. 1994. Interleukin-10 treatment can suppress stromal keratitis induced by herpes simplex virus type 1. J. Immunol. 153: 2258–2265.
. 2007. Resolvin E1 and protectin D1 activate inflammation-resolution programmes. Nature 447: 869–874.
. 2010. A new strategy for the identification of novel molecules with targeted proresolution of inflammation properties. J. Immunol. 184: 1516–1525.
. 2001. Contribution of vascular endothelial growth factor in the neovascularization process during the pathogenesis of herpetic stromal keratitis. J. Virol. 75: 9828–9835.
. 2005. Early events in HSV keratitis—setting the stage for a blinding disease. Microbes Infect. 7: 799–810.
. 2009. Anti-angiogenesis effect of the novel anti-inflammatory and pro-resolving lipid mediators. Invest. Ophthalmol. Vis. Sci. 50: 4743–4752.
. 2002. IL-17 expression in human herpetic stromal keratitis: modulatory effects on chemokine production by corneal fibroblasts. J. Immunol. 169: 5897–5903.
. 2008. IL-10: the master regulator of immunity to infection. J. Immunol. 180: 5771–5777.
. 2008. Resolution-phase macrophages possess a unique inflammatory phenotype that is controlled by cAMP. Blood 112: 4117–4127.
. 2001. Control of stromal keratitis by inhibition of neovascularization. Am. J. Pathol. 159: 1021–1029.
. 2008. Vascular endothelial growth factor in eye disease. Prog. Retin. Eye Res. 27: 331–371.